At the Roman Forum in the center of Rome there once stood a grand monument called the Temple of Peace, built by Emperor Vespasian to project his might and fortify his strong public image. The Temple was razed to the ground when Rome was sacked by the Goths in the early 5th century. Only a fire-ravaged interior wall survives. 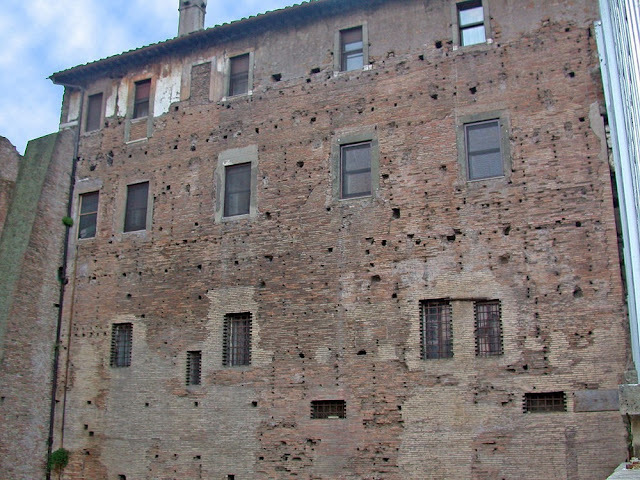 This wall later became the exterior of the Church of Saints Cosmas and Damian. 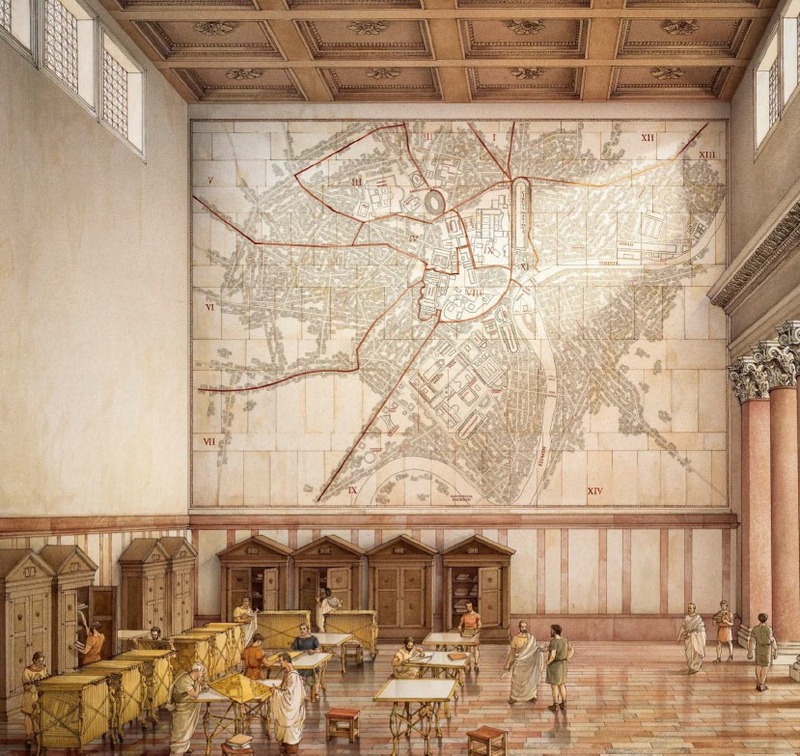 Back then, an enormous map of Ancient Rome carved in marble and measuring 60 feet by 43 feet adorned this wall. The holes in the wall reveal where the individual marble slabs were attached with metal clamps. Known as the Forma Urbis Romae, or Severan Marble Plan of Rome, the map depicted Rome’s urban landmarks across five square miles in incredible detail, showing ground plans of every architectural feature in the ancient city, from large public monuments to small shops, rooms, and even columns and staircases. Each structure was meticulously labeled. It was one of the most extraordinary maps ever produced in ancient times. Although the Temple was built by Emperor Vespasian, the map wasn’t produced until some 150 years later, by Emperor Septimius Severus sometime between 203 and 211. Rendered at a scale of approximately 1 to 240, the Severan Marble Plan was engraved on 150 marble slabs and was oddly oriented with South at the top. After Rome fell and the Temple of Peace was destroyed, the map was broken up into thousands of pieces and scattered throughout the city. Wall of the Temple of Peace where the Forma Urbis was mounted. For centuries scholars have been trying to piece together the lost map like a giant jigsaw puzzle, but only about 10 to 15 percent of the map survives, in almost twelve hundred fragments that range in size from a few inches to several feet. 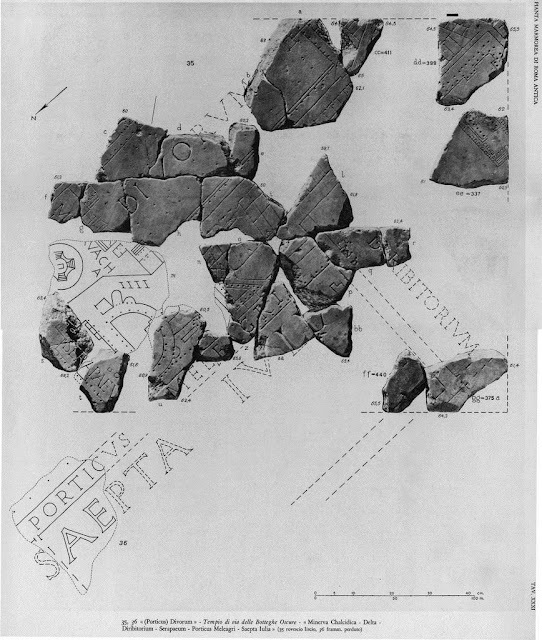 Images and 3D models of all the 1,186 surviving fragments of the map are now viewable online, along with descriptions of each piece. 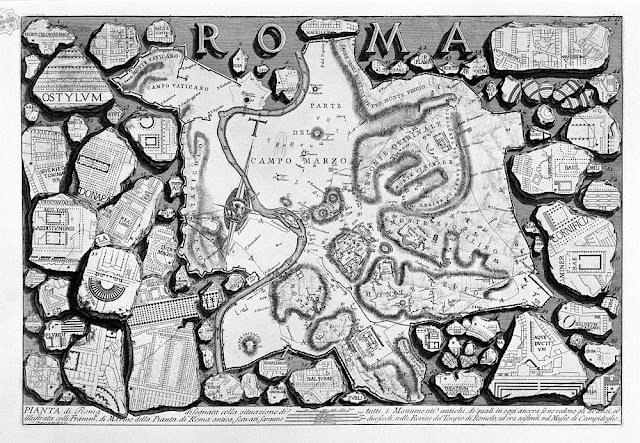 Map of ancient Rome and Forma Urbis, circa 1835-1839. 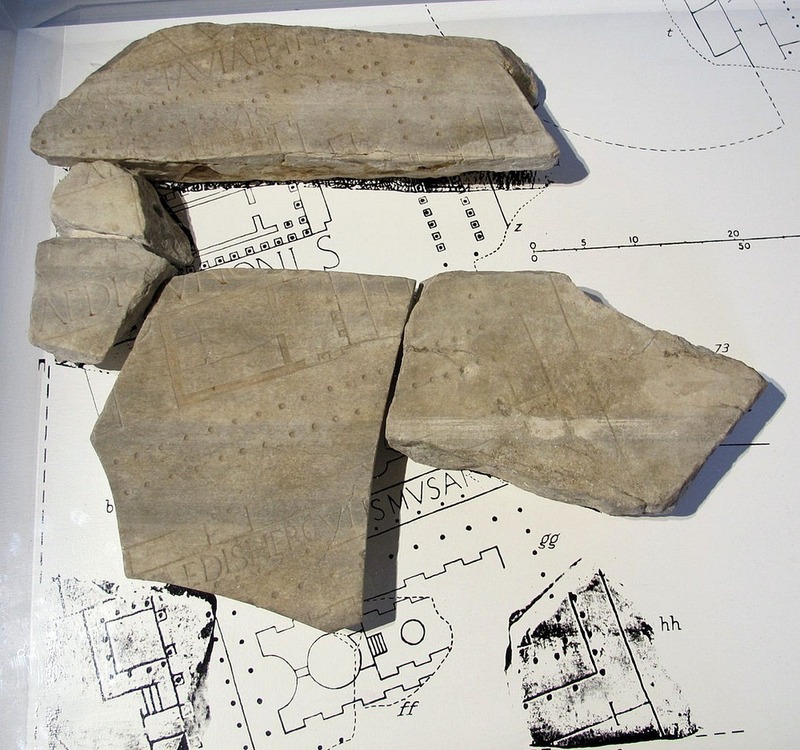 A fragment of the Severan marble plan showing the Porticus of Octavia.